Edible flowers are flowers that can be consumed safely. 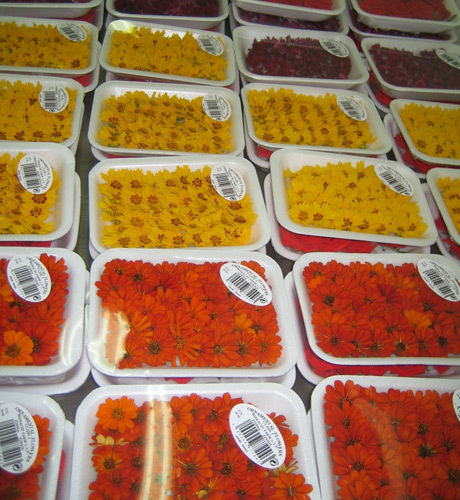 Flowers are part of many regional cuisines, including Asian, European, and Middle Eastern cuisines. Flowers are added to foods to provide taste, aroma, and color. They can be part of a main dish, a salad, or a dessert. They can be added as a garnish. Flowers can be incorporated into beverages as flavorings, or used to make teas or wines. They are added to spreads such as butter or fruit preserves, and to vinegar, marinades, and dressings. Some are dried and used like culinary herbs. Flowers are also consumed for subsistence. Many flowers that are technically edible can be far from palatable. For best flavor, flowers should be fresh and harvested early in the day. Wilted and faded flowers, and the unopened buds of most species, can be distasteful, often bitter. Many flowers can be eaten whole, but some have bitter parts, such as the stamens and stems. 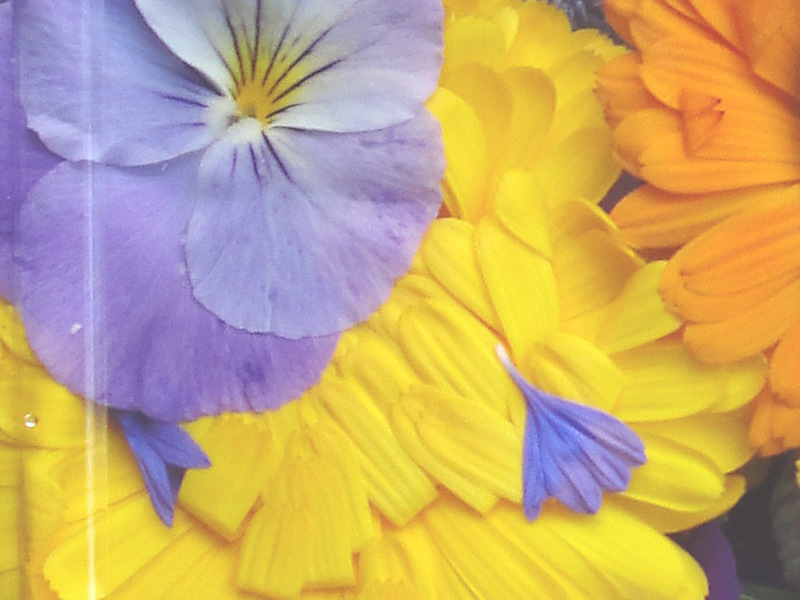 Farm fresh grower-direct flowers from following varieties: echinops, achillea, prothea, solidago, grevillea, leucospermum, chrysanthemum, wax flower, phlox, asclepias, ixia, matricaria, moluccella, limonium, trachelium, godetia, kangaroo paw, antirrhinum, crocosmia, curcuma, green bell, gerbera standard, roses, kniphofia, anemone, anigozanthos, gerbera, ozothamnus, carthamus, alstroemeria, bouvardia, gypsophila, freesia, gomphrena, rose spray, desert yearning, liatris, astilbe, banksia, narcissus, aster, eustoma, statice, capsicum, lisianthus, lilium, ranunculus, tanacetum, dianthus, craspedia, sunflower, calla, cotton, tulip, aconitum, matthiola, gypso, eremurus, ornithogalum, veronica, celosia, gladiolus, gerbera mini, campanula, globularia, hippeastrum, delphinium, iris, agapanthus, paeonia, roses small head, roses tea, strelitzia, etc. Fresh cut foliage of the following varieties: steel grass, hedera, cotton, philodendron, croton, viburnum, cycas, myrica, grevillea, myrtus, aralia, artichoke, euonymus, prunus, kochia, melaleuca, myrsine, ruscus, chondropetalum, bear grass, murraya, adenanthos, cyrtomium, acacia, cyperus, rhamnus, photinia, leucadendron, rotem, aspidistra, euphorbia, pittosporum, hibiscus, hypericum, eucalyptus, palm, agonis, cocculus, monstera, fern, salix, asparagus, etc. Fresh herbs and lettuce salads from leading Israeli growers: romaine lettuce, peppermint, red chard, rosemary, dill, spinach, parsley curly, arugula baby, thyme, lemon grass, tarragon, parsley flat, salicornia, basil green, baby spring mix lettuce, sage, chervil, basil, arugula deluxe, savory, mizuna, marjoram, tatsoi, marjoram sweet, rucola deluxe, arugula, chives, basil red, lollo rosso lettuce, rucola baby, mint, lemongrass, coriander, oregano, sorrel, bulls blood, rucola, baby mix salad, lemon balm, etc. Used as spices and seasoning herbs herb in recipes of healthy food cooking. All year long best price fresh herb and salad wholesaler supplies. Our produce can be delivered worldwide by air cargo carriers to the following international destinations: Colombia, Liechtenstein, Canada, USA, Bulgaria, Germany, Kyrgyzstan, Mexico, Vietnam, Ecuador, Republic of Ireland, Switzerland, Sri Lanka, Poland, Slovenia, South Korea, United States, Armenia, Hungary, Romania, Sweden, Gibraltar, Tajikistan, Indonesia, Czech Republic, Chile, Holland, Belarus, Latvia, Luxembourg, Georgia, Monaco, Finland, Bolivia, Australia, Estonia, Greece, New Zealand, Argentina, Slovakia, Malta, China, Belarus, France, Peru, Cyprus, Denmark, Turkmenistan, Iceland, CIS countries, Kazakhstan, Paraguay, Spain, Macedonia, Bosnia, India, Italy, Austria, Azerbaijan, Kazakhstan, Uruguay, South Africa, Taiwan, Moldova, Japan, UK, Laos, Andorra, Hong Kong, Philippines, Ukraine, Malaysia, Lithuania, Portugal, Brazil, Croatia, Singapore, Netherlands, Ukraine, Panama, Russia, Venezuela, Turkey, Nicaragua, Costa Rica, Belgium, Norway, Thailand, United Kingdom, Uzbekistan, etc.